Facial pain can be caused by many factors, ranging from tight neck & shoulder muscles to misalignment of the jaw or the cervical spine. This may be displayed as numbness, tingling, twitching or any number of odd sensations. Nerves all over the body course in between muscle layers, so if particular muscles become tight, there may be pain associated away from the area of tightness. 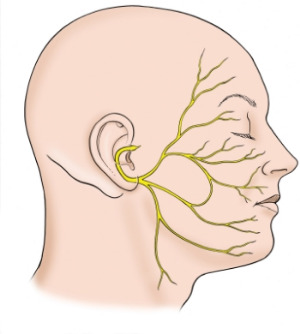 As the diagram shows, the main facial nerve comes from beneath the skull just below the ear then branches out, much like a tree, to send & receive signals from the respective branches.